Puppets and Poetry - Tucson Festival of Books 2017 from Jeanne Missey Osgood on Vimeo. Emily's Newfoundland dog, Carlo was given to her by her father in the winter of 1849-50. He was her constant companion for 16 years. His purpose in giving her Carlo was probably to provide companionship and protection. She had been home for over a year from being a student at Mount Holyoke female Seminary. He sister, Vinny was away in school, and Emily wrote of being lonely. In my one woman show of Emily, I have her holding a Newfoundland puppy, but have decided to create an adult Newfoundland dog who can interact with me and Emily (in process). 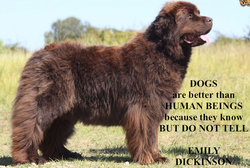 Emily wrote, in her usual wit that, "Dogs are better than human beings because they know and do not tell!" Emily Elizabeth Dickinson, a 19th Century American writer, remains one of the most significant and widely read poets in the world today. She lived a quiet life, and after the age of about 30, chose never to leave her father’s grounds, preferring the company of close family, her dog, and a few chosen friends. She enjoyed reading, writing, baking and gardening. She never married, and lived with her sister, mother and father in the same house where she was born and died in Amherst, Massachusetts. Her poetry was considered unusual for the day. Instead of dwelling on the outside world as most poets, she focused on the inner world with the microscopic scrutiny of a scientist, as well as, showing groundbreaking adventurousness and innovation in meter, imagery form and rhyme. Of the nearly 1800 poems and 1000 letters that survive, only about 10 poems were published during her lifetime, and most of those were heavily edited and printed without her permission. It is assumed, that no one was aware of the great volume of poetry until after her death, when her sister, Vinnie, found bundles of poems in a bottom bureau drawer in the poets bedroom. Emily’s 25-year friend and preceptor, Thomas Wentworth Higginson, described her verse as “poetry torn up by the roots with stones and earth and dew still clinging to them, giving a freshness and fragrance not otherwise conveyed”. But, he also wrote that she drained his nerve, referring to her as “his partially cracked poetess”. There has been much speculation as to why she chose to stay home, out of the public eye, to take care of aging parents. The myths and legendss continue to rush in and fill the gap: was it unrequited love, a strict father, illness (mental or physical) or the conscience choice of an artist? A wounded deer leaps highest! • Really Enjoyed your witty and dramatic presentation of Emily Dickinson! Great Job! • Spirit of Emily Dickinson came alive in your show! Loved it! • Granny embodies goodness through and through. The stories were heart-warming and funny!